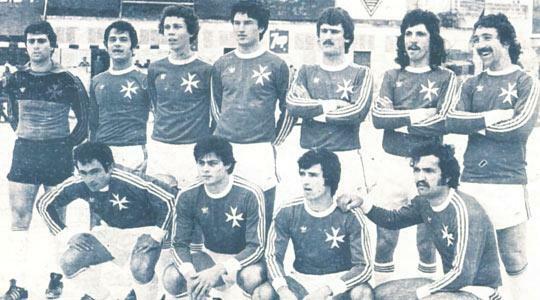 Malta before the match against West Germany on February 25, 1979. Standing (from left): C. Sciberras, J. Holland, G. Xuereb, N. Buttigieg, E. Spiteri Gonzi, D. Buckingham, E. Farrugia. Squatting: V. Magro, E. Farrugia, R. Xuereb, G. Xuereb. Despite all the difficulties Maltese football was facing at the time, 1978-79 was a good season for the national team. During that campaign, Malta obtained two noteworthy results on the international scene. Under the guidance of ex-international goalkeeper Victor Scerri, Malta held mighty West Germany to a goalless draw at the Gżira stadium and then, a month later, only lost 1-2 to Turkey in Izmir. In this match, Ernest Spiteri Gonzi scored Malta's first goal away from home in 17 years. The match against West Germany will always be remembered for the great performance of our players. Showing an impressive will to fight against the odds, Malta refused to be intimidated by the big names in the German team. The Maltese played the game of their lives to earn a remarkable 0-0 draw. After the match, scenes of joy were witnessed as some 10,000 fans sang their way out of the stadium. It was so good to be Maltese that day. For once, there were only cheers, applause and fervent, passionate support for the national team. The huge crowd that turned up for the match, despite a bus strike and the chill of a February afternoon, was rewarded with a superb display of football. In the first half, the Maltese played skilfully and had two great scoring chances. In the second, Germany threw everyone in attack, but Malta did not budge an inch. At one time, the mouse even threatened the lion when Valletta winger Vincent 'Maxi' Magro tested goalkeeper Sepp Maier with a curling free-kick. That day, the Maltese went to the stadium to see the stars of Germany. But, it was not Bonhoff, Rummenigge, Muller or Fischer who caught the eye, but a certain 19-year-old from Tarxien with the name of Ġużi Xuereb. At first, Xuereb was marked by Cullman but he tormented the Cologne midfielder and Jupp Derwall assigned Bonhoff to shadow the Malta midfielder. But even this tough German defender could not stop Xuereb that day. The Hibs' darling was still able to display most of the artistic numbers in his repertoire to push his fighting companions forward. Emmanuel Farrugia played a blinder and, together with Ray Xuereb, built up a defensive barrier which no German could penetrate. In the second half, West Germany had the wind behind them. They took the initiative but John Holland and Farrugia erased the threat offered by the two dreaded Schalke raiders, Fischer and Abramczik. Goalkeeper Charlie Sciberras was excellent. He made two great saves in crucial moments that kept Malta in the game. Norman Buttigieg, playing in the delicate role of libero, rarely put a foot wrong, and was a constant inspiration to his colleagues. Every Maltese player was a hero, but it is Xuereb's magic that still lingers in my memory. On June 28, 1962, Malta lost 1-6 to Denmark in the European Championships. It was Malta's first venture in an international competition but, despite the negative scoreline, it was a significant occasion, if anything for the goal scored by Eddie Theobald which was the first Malta goal away from our shores. Seventeen long years had to pass before Malta scored another goal away from home in an international competition. Once again the occasion was the European Championships and, by coincidence, the scorer was Spiteri Gonzi, another Hibs player. After so many disappointments away from home, culminating in the 0-7 defeat against Wales in October 1978 in Wrexham, the Malta team at last managed to break its scoring duck. On March 18, 1979, Malta lost 1-2 to Turkey, a result which Reuters described as another surprise from Malta. According to the international news agency, Malta adopted the same defensive tactics that earned them a shock 0-0 draw with West Germany the previous month. This result was undoubtedly the best achieved by the national team away from home up to that time. It also gave the Maltese the consolation of scoring another away goal courtesy of Spiteri Gonzi.